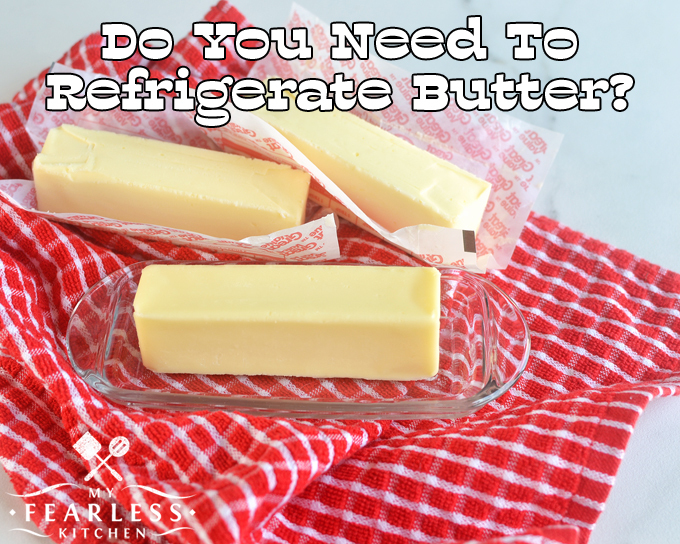 You are here: Home / Kitchen Tips / Do You Need to Refrigerate Butter? 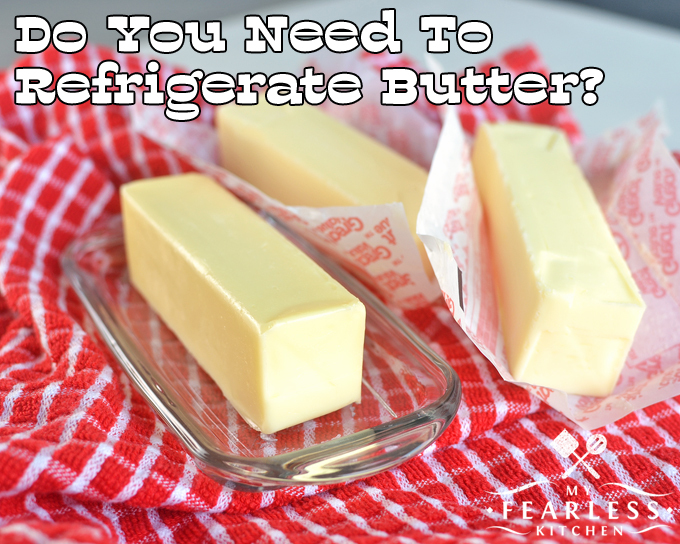 Do you keep butter on the counter so it stays soft or do you keep butter in the refrigerator? Should you keep butter out, or should you refrigerate butter? Here’s how to keep softened butter safe for your family. 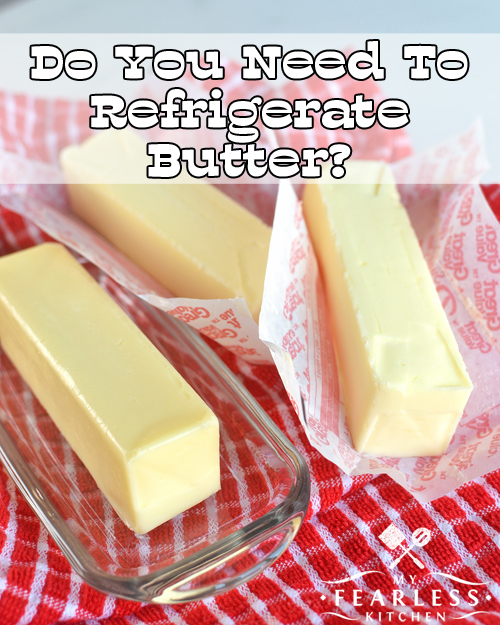 Can You Keep Butter at Room Temperature? Butter is a dairy product. And we all know that dairy needs to be refrigerated, right? But butter is just so much easier to spread on bread and it tastes better if it’s soft… So, is it all right to keep butter at room temperature? Technically, butter should be refrigerated. But let’s talk about butter for a minute. Butter is cream that has been churned, had the extra water removed, and pressed into a solid shape. Butter is 80% fat, and 20% water and milk solids. The high fat content in butter makes it a little bit of a special food (it also makes it high in calories). Bacteria can’t get through fat very well, so it doesn’t spoil as quickly as other dairy products. Over time, the fat and water in the butter react with each other and can cause the butter to go rancid. This reaction is sped up when butter is exposed to light or warm. Temperatures over 70 degrees speed the reaction even more. Refrigerating butter or keeping it covered will slow this process. Choose a butter crock like this one or a butter dish like this one to keep the light out. Eventually, if you don’t use it fast enough, all butter will go rancid, no matter how you store it. Keeping it at room temperature will make it go rancid faster than if you refrigerate it. If you prefer to keep butter in the refrigerator, but want soft butter to spread on bread or French toast, you can take it out of the refrigerator about 10-15 minutes before you want to use it. That’s all the time it takes for most butter to reach a spreadable consistency. If you want to keep butter out of the refrigerator longer than that, keep basic food safety rules in mind. Any perishable food should be refrigerated within 2 hours at room temperature (1 hour if the temperature is 90 degrees F or above). If you want to soften butter for a recipe, 15-30 minutes at room temperature should be sufficient. You can also soften butter in your microwave. Since all microwaves heat differently, be sure to check your manual for the recommended times. If you’re making a recipe that calls for the butter to be cut in, you’ll want the butter cold, right out of the refrigerator. As for me, I keep our butter in the refrigerator. I like to use Land O’Lakes Spreadable Butter when we are looking for something that spreads easily, like for this Pepperoni Pizza Grilled Cheese Sandwich! 74 years of age – have always had 1/4 lb in the cupboard unrefrigerated. As long as you go through it quickly enough, that’s great.